SEASON FOUR, EPISODE SEVENTEEN- "IDENTITY AND CHANGE"
Well, this was a rather emotional episode. 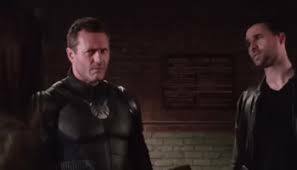 Coulson and Skye meet Mace in The Framework, and he may just be the Inhuman we believe he was in the real world. Jemma doesn't trust Ward. Mack has a daughter in The Framework, and is just trying his best to survive. And, well Fitz in The Framework, well he's really a bad guy. How bad? So bad he killed Agnes in The Framework, so Radcliffe will NEVER see her ever again. That was right after Jemma convinced Ward NOT to shoot Fitz aka The Doctor in the Framework. Apparently, in The Doctor in this universe is the big bad, The Red Skull, Von Strucker. I don't think Madame Hydra, the identity Aida assumed herself in The Framework, but it could be Fitz himself. That's kind of a sad thought. Especially since Jemma is distraught after Fitz/Doctor shooting Agnes in cold blood, capturing Radcliffe and allowing for the severe beating and torture of both Radcliffe and potentially Daisy. We don't learn too much about Mack and his role in The Framework. We know he has a daughter that he calls Sparkplug (a little Easter Egg for those who know the comics). He is a family man. He follows HYDRA's orders just to keep her safe. His daughter brings home a piece of a HYDRA drone, which is a big no-no. They get taken into HYDRA custody for it. But kind of not. See, May is onto Skye in this world and she is able to get Mack to reveal Skye's true identity. Mack doesn't know anything about his life in the real world, but him helping HYDRA gets Skye captured. Fitz may kill her next week, and we are already planning on seeing a rescue mission of some kind next week. With Jemma heartbroken, Skye captured, Radcliffe in regret and Agnes now dead, its safe to say that this third storyline in this fourth season is really piling on the angst. I don't think our heroes have ever been put through this much of a wringer on this show so far. With Radcliffe not in control, we don't know if our heroes will ever get out of the this Framework, and that's really sad. This season has been full of missed opportunities and weird decisions, but I'd be lying if I said that this third storyline wasn't delivering the goods. This represents what happens when this show is at its very best, here's to hoping it can stay this way into season five.